"If you get it right, the client doesn't notice," says Mr Ben Breen, managing director of design consultancy Space Matrix. "If you get it wrong, it's an absolute disaster." The rise of open-plan offices, which encourage collaboration and the efficient use of space, have also driven the need for more sensitive noise control - with companies experimenting with features such as private phone booths and sound-retardant spray paint which leaves a raised surface. Traditional methods remain the most common: acoustic panels, rockwool insulation, double-glazed glass walls and slab-to-slab insulation extending from beneath the floor to beyond the false ceiling. Products that combine aesthetics with functionality - such as wavy echo boards and perforated timber - are also getting more popular. Hipster-esque companies such as creative agencies might even line their walls with painted egg cartons. One trend that has been catching on here, in companies such as Lego and GSK Singapore, is Activity-Based Working. Employees head to different "focus zones" depending on what they are doing - from private rooms for consultations to informal meeting areas to presentation spaces. This makes it easier to compartmentalise the office's sound levels, says director Shafie Latiff of home-grown design firm BBFL, which was behind the look of Lego's office in Singapore. Activity-Based Working has not caught on everywhere. Law firms, banks and consultancies might prefer individual workstations and highly soundproofed rooms as meetings with clients are confidential. Mr Breen says the acoustics of design is "about creating zones and making sure you cater to everyone's requirements within them". 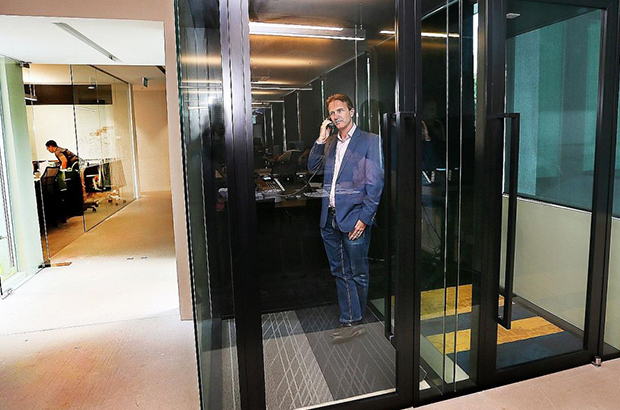 Space Matrix designed Tata Communications' new Singapore office, which features phone booths and sound-absorbent panels, and has speakers emitting a loud form of ambient noise to muffle the chatter in the noisier sales area. Datumstruct Solutions, which distributes Finnish-made Framery phone booths (starting at $14,000 for a one-person sound-insulated booth), has seen exponential sales since these were launched in 2015. It can be a challenge convincing a client to invest in sound insulation - much less get an acoustic consultant in the first place, Mr Breen says. There are other issues. Sometimes, air-conditioning ducts run from room to room, allowing sound to travel through them. The solution, he adds, would be to re-work the office's mechanical and engineering services or add insulating material. Acoustic consultant Chung Wan Li, director of acoustics at Sennen Design, hopes more people will recognise the importance of what acoustics experts do. Mr Chung, who was roped in to help with the acoustics of Netflix's new office here - which will contain a mini-cinema enclosed within two sound-insulating shells - adds that demand for acoustic consultants will vary according to the project. "Cost is always the driving factor." To get a sense of what a building will look like when it is completed, one has to reach only for the architect's renderings. These days, seated in the acoustic sweet spot of Arup's SoundLab, you can also appreciate the acoustics of a space before it is built. Clients who wonder what difference an extra layer of insulating plasterboard or rockwool between two rooms will make, for instance, can listen to aural simulations that reflect how sound travels in the space. The premise of the SoundLab, which opened in Arup's Keppel Towers office two years ago, is simple: Rather than bewilder people with industry jargon such as "Weighted Sound Reduction Index (Rw)" and "reference level", or try to articulate subtle changes in sound, why not let them hear the difference themselves? Dr Xu Jingfeng, Arup's associate principal acoustic and audiovisual engineer, says the aim is to help people make informed decisions and work more effectively within their budget. About five corporate offices in Singapore have used the SoundLab so far and its other clients range from healthcare groups to the Art Deco-style Atlas Bar. SoundLabs, which can be found in some 15 Arup offices around the world, were first used by concert-hall designers. Virtual-reality goggles also help clients in the SoundLabs visualise the space while appreciating the gradations in sound. Arup's acoustic experts also advise clients on elements such as insulating partitions, acoustic panels, "sound-masking" and facade designs. Sound-masking is when speaker systems - emitting a louder form of ambient noise - are installed to muffle the sound of conversations. At the moment, it is common only in call centres, but might be increasingly relevant because of the rise of open-plan offices and quieter air-conditioning systems, which are a source of ambient noise. Dr Xu says that these days, more clients opt for sustainable materials for sound insulation, such as recycled rubber and fabric. One way to reduce waste and costs, he adds, would be to line just the middle swathe of a wall with sound-absorbent material. Sound bouncing off the lower and higher parts of the wall tends to be less likely to reach people's ears. The Building And Construction Authority's Green Mark ratings and the Well Certification, which monitors a building's features that affect the well-being of its occupants, are other incentives for companies to improve their acoustics, he adds. Dr Xu found his calling after doing a module in building acoustics at university. "Building services - chillers and pumps - create noise and vibrations in the building. So, I became interested in how to minimise it." The job is exciting because no two projects are the same, he says. Many office layouts situate the director's and meeting rooms near the building core - but these tend to be the noisiest parts of the floor as they are near the lift shafts, mechanical plant rooms and toilets. Acoustics experts, who should ideally be brought on board early in the game, would advise these offices to introduce insulating materials, for example, to meet their specific needs. In other situations, it is sometimes a balancing act between aesthetics and sound. A chief executive officer who wants to be able to hold confidential meetings in his room might also prefer not to be hemmed in by thick partitions. One solution, Dr Xu adds, could be to install a sound-masking speaker in the personal assistant's room. Experts in acoustics are the unsung heroes of the design world. "You don't notice it until something goes wrong," he says. Clients who wonder what difference an extra layer of insulating plasterboard or rockwool between two rooms will make, for instance, can listen to aural simulations that reflect how sound travels in Arup's SoundLab. For designer Paul Semple, the acoustics of design is not so much about cutting-edge technology as it is about understanding how people behave and organising spaces accordingly. You can create an environment to dictate how people behave by leaving subtle visual cues, says Mr Semple, a principal at design practice Hassell. A pantry area could have hard surfaces or neon lights, while a cave-like, upholstered area would encourage people to be quieter in the environment. Among Hassell's clients are GSK Singapore, which opened its Asia headquarters last year; and The Great Room Offices - targeting mature start-ups - which this year launched another space on levels 17 and 18 of Centennial Tower. The Great Room, an elliptical 36,000 sq ft co-working space, caters to hot desking and has dedicated office spaces, carrels, sound-insulated meeting rooms and a lounge area with sofas, bar seating and cosy alcoves. It is about letting people choose where they want to work, out of an assortment of spaces that might have different noise levels, he says. Mr Semple speculates that more widespread use of voice recognition software in the future could drive greater demand for carrels that reduce the noise disruption people may cause co-workers when dictating to their machines, for example. He adds that having more connective spaces is also important for collaboration. "It's about understanding that the acoustic condition of a place is critical to its success," Mr Semple adds. With a nod to flexible, "amorphous" spaces such as the lounge area at The Great Room in Centennial Tower, Mr Semple adds: "They are where the magic happens, they are where the deals are made." Oracle's Digital Hub in Pasir Panjang Road is a colourful hive of different aural environments - from private "business class" workstations to sound-insulated rooms to open meeting spaces designed to create a buzz. The computer technology corporation's office, which towers 22 storeys over Mapletree Business City II, is home to its digital sales team in Asia. There are no executive offices. Employees' desks are spread over zones - adorned with graffiti art and Asian motifs - which feature open meeting spaces, workstations and private conference rooms. "We wanted it to be more interactive, more friendly, more human," says Mr Karim Mohamed, head of organisational development and transformation at Oracle Digital Prime, Asia-Pacific. The space is "fluid" - deliberately crafted to encourage spontaneous interactions. If you hear something during a co-worker's presentation in an open meeting space that tickles your fancy, all you have to do is perch yourself on an adjacent bar stool designed for this purpose - and lean in. "Years ago, the idea of a modern office was synonymous with (sheer) openness. But we realise it's not necessary... We have created plurality of space," says Mr Karim of the office, which was designed by home-grown design firm BBFL and officially opened in February. Many flexible meeting spaces are not hemmed in by walls. Those that are enclosed, such as more than 20 sound-insulated rooms used for video conferencing, are available on a first-come, first-served basis. The office's black ceiling has been treated with sound-retardant spray. The two pantries are lined with Bolon material - a type of non-slip, insulating fibre - while the carpet for the rest of the office is made of recycled yarn. Both are sound-absorbent. For a series of individual upholstered workstations overlooking the sea, the seats are partly surrounded by frosted plastic and come with adjustable desks and lamps. "Staff here call these the business class seats. We are moving away from people having conversations at (their dedicated) workspaces," he adds, with a nod to the flexible work and meeting spaces in the office. "Noise is sometimes more visual than sound: If I don't see you, I'm not disturbed by you." When The Straits Times visited the office last week, there was an unobtrusive murmur of activity as employees typed away, helped themselves to food in the pantry or brainstormed on interactive digital screens in open meeting spaces. Effort has been taken to reduce noisy distractions, but there is always time for spontaneity. A 1.5m-high gong in the office is not just a decorative centrepiece. "The team wanted to recognise every time someone closed a deal," says Mr Karim. "If you hit the gong, people will start clapping." He is not the only staff who sings its praises. "There is a positive vibe," says Mr Ronen Naishtein, general manager of Oracle Netsuite, Asia-Pacific, who uses the virtual meeting spaces several times a week. "It helps us get motivated to come to the office, it encourages collaboration."